After running a food truck, catering business, and roving pop-up series, San Francisco’s Fernay McPherson is ready to settle into a brick-and-mortar. Her ultimate goal is to open a soul food restaurant in her native Fillmore district, where Black-owned restaurants are increasingly difficult to come by. But she hasn't been able to find a space. In the meantime, she’ll open Minnie Bell’s Soul Food Movement in Public Market Emeryville. On Thursday, March 15, she’ll take over Nyum Bai’s kiosk and hopefully follow in the Cambodian restaurant’s footsteps with her very own, full-fledged brick-and-mortar at the end of the one-year lease. In Emeryville, Minnie Bell’s will function as a fried chicken joint. McPherson first started serving fried chicken from her old food truck and sticks to the same style. “It received a lot of great reviews,” she said. Specifically, she brines her chicken in hot sauce, buttermilk, and fresh rosemary for 24 hours before dredging it in flour. 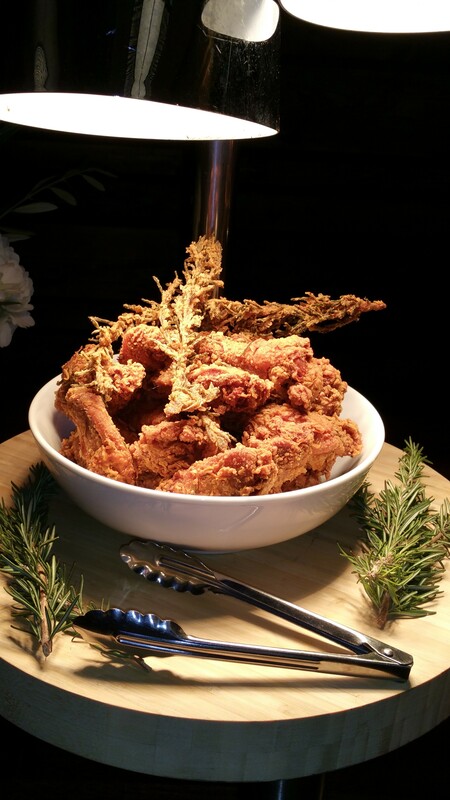 But she dredges whole stalks of rosemary, too, and drops those in the fryer alongside the chicken to help infuse the meat with even more flavor. Folks will be able to order chicken by the piece or as a meal — the smallest meal consists of two pieces with cornbread and a side for $9.75, or you could feed a family of four for less than $40. Southern sides, including classic mac ‘n’ cheese and collard greens, will rotate. McPherson will also whip up seasonal specials, waffles with fruit on the weekends, and dessert, though she’ll feature sweet potato cheesecake from Oakland’s Crumble & Whisk as well.